You’ve had stressful times in the past. I am sure of that. And you made it through. Those hard times helped you grow. They turned you into the person that you are today. You are stronger because of them. You are you because of them. But what’s happening now? 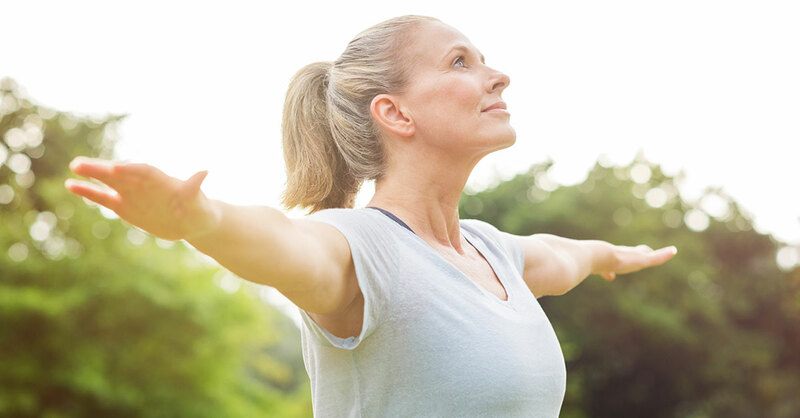 This time of life may feel like another big challenge, not because anything particularly dramatic is happening externally, but because of the dramatic internal changes you are experiencing as you approach menopause. It can feel like a very big deal, and when external stresses happen—parents aging, children leaving home, friends needing you—you may wonder if you can handle it while you are also grappling with who you are becoming as you get older. Is this new older you as reliable, as capable, as grounded as you were in the past? It’s not a simple question. It’s not a small problem. It’s not easy. You are changing in some important ways—not just in how you look and feel but in how you see yourself and how you relate to the world. It can be stressful, no question, so how will you get through it in one piece? I have a suggestion—not just as a doctor, but as someone giving advice to a friend. If you want to get grounded, get in touch with who you are becoming, and find yourself when you are feeling a little bit lost, meditation might be just what you need. There are many good reasons to start meditating. Your heart, for one. The American Heart Association recently published guidelines on meditation and cardiovascular risk reduction. This is the first “scientific statement” explaining the benefits of meditation on reducing the stress response as well as blood pressure, improving smoking cessation rates, and decreasing both insulin resistance and heart disease risk. As a cardiologist, I want you to know about this powerful tool. But meditation is more than just good for your heart. Its stress-reducing power is legendary. Meditation improves sleep quality, mood, and life quality. If you have been living with crushing anxiety, a racing heart, hot flashes, mood swings or a feeling that you don’t know yourself anymore, meditation can ground you again. It can get you back in touch with yourself. Meditation is simply time you take each day to sit down and be quiet and just feel who you are. It enables you to tap into those parts of you that are strong, resilient and reliable. It stabilizes all that might be rocky and ensures that you will be able to handle all that is thrown in your direction. So how do you do it? Transcendental Meditation (TM) arrived on our shores as a fad in the 1960s along with the Beatles, but like the Beatles it proved to be much more than a fad. What has transpired in the last 50-plus years is a slew of research studies showing genuine benefits of TM on the brain, the heart, and overall well-being. Although there are many types of meditative practices ranging from mindfulness to insight meditation, creative visualization, guided meditation, loving kindness meditation and more, TM is the most studied and the most documented in terms of its positive effect on the relaxation response, settling the mind, increasing consciousness, reducing stress, improving health measures and increasing happiness. To learn TM, you can contact a teacher or a center, but any kind of meditation will likely be useful, settling, and grounding for you. (There’s even a kind of meditation specially meant to reduce chronic pain.) Take a class, read a book, look up videos about how to do it—choose the type that speaks to you, and sit down and start. Why not today? When your menopausal ship is rocking, and something as simple as sitting with eyes closed and repeating some syllables can make you stronger, more flexible, more resilient, more powerful, and happier, then I say, let’s get to it! The benefits are well worth the once-or-twice-daily 20-minute time slot. No matter how well you eat, no matter how much you exercise, and no matter how well you communicate with your doctor, there is no substitute for mental calm and clarity. This is how you live from the heart. Meditation is a way to find yourself again no matter what is happening to your waistline, your face, your feet or how anybody else sees you. You are a constant, gorgeous being glowing with the wisdom of life experience, and meditation can hold a mirror up so you can see that about yourself. So you can see your essence. When you see that part of you, it gets a lot easier to love yourself…and that might just be the whole point.